The MetaObject Facility Specification™ (MOF™)is the foundation of OMG's industry-standard environment where models can be exported from one application, imported into another, transported across a network, stored in a repository and then retrieved, rendered into different formats (including XMI™, OMG's XML-based standard format for model transmission and storage), transformed, and used to generate application code. These functions are not restricted to structural models, or even to models defined in UML - behavioral models and data models also participate in this environment, and non-UML modeling languages can partake also, as long as they are MOF-based. We'll explain what this means in a moment. OMG® is a not-for-profit, open-membership computer industry specifications consortium; our members define and maintain the MOF specification which we publish in the documents linked on this page for your free download. Software providers of every kind build modeling tools that manipulate models in MOF-compliant format - export, import, store, transform, generate code, and so on. OMG doesn't provide any of the software - we provide only the specifications that make software products interoperate. If you're responsible for your company's modeling and development environment (CIO, Chief Architect, or report to these positions) you need to be aware of all of the benefits that result when your tools produce MOF-compliant models. It will help if you know the basics of how things work, but you do not need to know any details and certainly don't need to read the MOF specification itself. You'll use this knowledge to ensure that every tool in your development chain from model-building in analysis and design all the way to application development and maintenance is MOF-compliant, integrating your modeling activity with your downstream IT. If your company produces and markets tools that produce or manipulate models (such as a modeling tool, repository, transformation engine, code generator, analyzer, test generator, or anything else in this category) then the MOF specification was written for you. Download the specification (it's free! ), read through it, and have your tool create, manipulate, and store its models in a MOF-compliant way. We recommend exporting and importing in our standard XMI format, which is MOF-based. OMG's MDA is our industry-standard architecture. 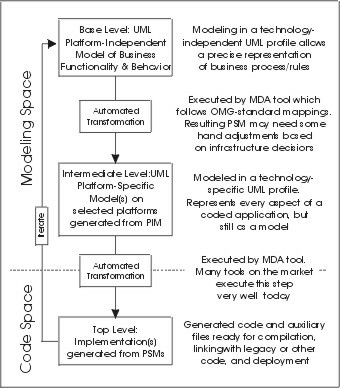 Based on MOF-enabled transformations, the MDA unifies every step of the development of an application or integrated suite from its start as a Platform- Independent Model (PIM) of the application's business functionality and behavior, through one or more Platform-Specific Models (PSMs), to generated code and a deployable application. The PIM remains stable as technology evolves, extending and thereby maximizing software ROI. Portability and interoperability are built into the architecture. MDA relies on the MOF to integrate the modeling steps that start a development or integration project with the coding that follows. You can read about the details on our MDA Specifications Page, which starts by describing the importance of MOF to MDA and continues with references to the additional OMG standards that complete the set. Model portability is so natural that many MDA code generators do not include their own modeling capability - they require users to use their preferred modeler out of a list of compatible candidates! The current version of the MOF may always be downloaded here. Archived past versions are available here.